Globalization in the 20th and 21st centuries has changed the face of business forever. Multinational corporations, international trade groups, and many more business entities are looking for people trained in the dynamic world of international business. Whether you want to focus exclusively on international business or simply make it a part of your general business study, institutions in the US are ready to launch your international business career. In 1988 the US Congress passed the Omnibus Trade and Competitiveness Act, which partly called for American universities to set up a Center for International Business Education and Research (CIBER). Over the past couple decades, hundreds of American colleges and universities have set up CIBERs or related centers in order to keep up with the trends of globalization. The overall goal of these centers is to promote US interests in a global marketplace by making new generations of businesspeople savvy in international business practices and educating them on the global marketplace. Now a quarter century later, the US has become a major player in international business education at the college and graduate levels. International students that study international business in the US are positioned to enter the global marketplace with strong foundations in both classic business skills and international business skills necessary to flourish in the 21st century. In short, international business is business that engages with clients in more than one country, and the study of international business is the study of the complex relationships that emerge from these engagements. Business in the 21st century has transcended traditional borders and one of the most important things to realize in this era of globalization is that business is conducted differently in different cultures. A degree in international business prepares students for diverse styles of business strategy implementation by way of dynamic management and organization. International business is taught differently depending on the institution, but international students who wish to study international business in the US will see a similar core method. To earn a certificate or degree in international business, most students will experience an education in both the traditional classroom and beyond. Coursework can only teach so much about the dynamic world of international business, so most international business programs require internships with multinational corporations or other internationally active business groups. In addition to internships, some programs offer exciting study abroad or exchange opportunities where students are encouraged to spend part of their training in a non-US setting. International business programs tend to be interdisciplinary by focusing on three main areas: globalization, international relations, and the global marketplace. Thus, elements of sociology, history, political science, cultural studies, and economics play prominently in these programs. You cannot conduct business around the world if you don't know something about how the world works, right? Training in these socio-cultural aspects of international business helps international students thrive in a variety of global settings. A final piece to international business education is networking. All businesspeople and business students are familiar with networking in general, but international business give networking a lot more nuance. Central to international networking is language study. Business in the 21st century moves too quickly to rely on translators or to be bogged down by traditional language barriers. Therefore students who study international business in the US are often required to undertake rigorous study of languages relevant to their intended region of work. 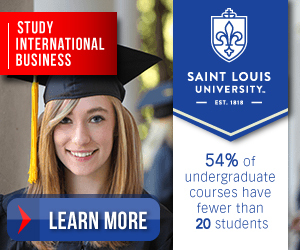 Obtaining a certificate or degree in international business can be accomplished through a variety of means. Different US institutions handle their interaction with international business differently, so considering which kind of program works best for you is important. Some schools feature a massive international business program where international students are immersed in international business from start to finish. The Darla Moore School of Business at the University of South Carolina	is one such program. Ranked as the #1 undergraduate international business program by US News and World Report, USC's program focuses on modern multinational enterprise within socio-cultural contexts. In addition to general international business studies, this program allows enhanced focus on China through a partnership with the Chinese University of Hong Kong and on the Middle East/North Africa through a partnership with American University in Cairo, Egypt. For international students who may not want to dive full on into a big international business program, there are many other options. The Mays Business School Center for International Business Studies at Texas A&M University offers certificate programs that augment standard business degrees with an international specialization. The world-famous Wharton School of Business at the University of Pennsylvania offers a secondary concentration in global analysis to go along with their top-notch business degrees. Whether you just want to dabble in a few international business courses, obtain a certificate, or earn a full-fledged degree in international business, when you study international business in the US there are institutions that cater to your desires. Visit the Study in the USA School search to find schools that offer programs of study in International Business. Over time we will be updating this section and including more information for those who want to study international business in the USA and for other countries, but please feel free to post your thoughts and comments on our Facebook fan page, and also follow us and post questions through Twitter.